Another daytime squall. Better than at night! Last night went quite well for us. Despite being the dark of the moon, the clouds cleared somewhat and we had plenty of starlight and no squalls. Winds all night were light so we had an engine just ticking over at idle, but we were able to shut it down today and just sail. Yay! When the wind filled in this morning it was very far forward - too much so to sail. So we reconsidered our destination and decided to head for the Surin Islands once again. This gave us a much better angle on the wind. We're still worried that the Surin anchorages may not be tenable with these winds, but we should arrive in the morning, which will give us time to head to the mainland (only 20nm away) if conditions are too bad. OK, so we've been wandering all over the Bay of Bengal and the Andaman Sea, but this time we think we'll actually get there! 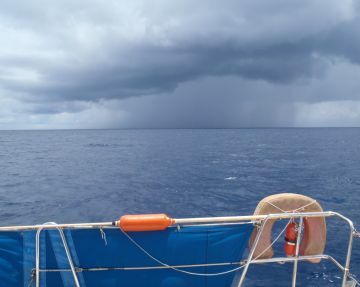 Today we've had fairly normal tradewind conditions - brilliant blue sky, puffy clouds, 15‑20 knots of wind, whitecap-flecked deep blue ocean ... and a few squalls here and there. These ones seem to be moving more north than NW, so require a different dodging technique. The sea-bed here rises from 8,000' to only 1,000' (2500m-300m) in only 20nm. This can produce some serious upwellings, resulting in a pretty disturbed sea. We saw this several times as we crossed from the Similan Islands to the Andamans in February. We're hoping that as we get closer to the Surins the sea will mellow out, as we're bouncing around a bit. At noon today we were at 9°20'N 96°15'E, or 95nm from the Surins, having sailed 235nm from Little Andaman (see a Google map of our positions here). 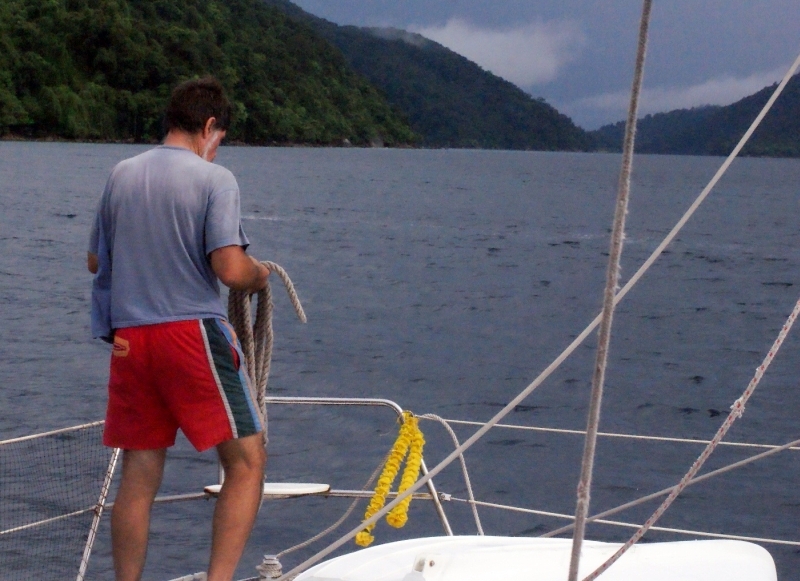 We have 15 knots of wind from 60° apparent, and Ocelot is happily splashing along under jib and double reefed main. We tucked the reefs in for earlier squalls, but left them in so we don't arrive too early. The GPS is predicting an 8:30am arrival time, which is fine with us. Land Ho! 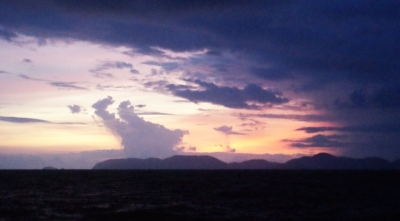 Surin Islands at sunrise. And another squall! We've ARRIVED ... And BOY, are we glad! The last 24 hours have been pretty tough. Yesterday was bright and blue and gorgeous, but there were lots of squalls around as well. Dodging them is work, with lots of sail trimming and trying to guess where the squall is going and how fast and how best to avoid it. Early on we got too close to one and had to take 2 reefs as we saw 33 knots of wind. Since we needed to keep our speed down to less than 4.4 knots (or we'd arrive at night) we left the reefs in, even though we had gorgeous conditions. Ocelot would have loved them - 16‑18 knots from aft of the beam. We'd have been scooting along at 7‑8 knots. (Even so, the GPS says we went over 11 knots at times). A bit frustrating to have to waste such wonderful wind, especially when we've motored most of the way across the Bay of Bengal because there was no wind. Usually our skies tend to clear a bit at night, but not last night. The squall dodging continued, only now we couldn't see very well as there was no moon or stars, just lightning. It kept all of us on our toes, and nobody got much sleep as we were caught by 2 more 30+ knot squalls, each with torrential rain. Interestingly, there were several fishing boats about 20nm out from the islands. These boats were evenly spaced along the coast and have dozens of huge lights on them to attract the fish. We could see the loom of their lights long before we could see the boats themselves. This glow on the horizon was pleasing - guiding lights for us, and the squalls rarely blocked all of them. This morning brought sight of land(!) ... and the obligatory squall, which wasn't very intense but did blot out the land for 30 minutes or so. We were going to head for the main anchorage on the west side of the islands, but given that the wind was now well behind us, we decided those anchorages would be exposed so we ducked around to the east side. At 9am we picked up a convenient mooring so as not to damage the coral with our anchor. Possibly a bit like childbirth, arriving at a destination makes you forget all the tough times it took to get there. This place seems delightful, with thick green vegetation covering the 2 main islands, placid green water over coral near shore, little islands dotted here and there for snorkeling on, and even some sandy beaches between the mostly rocky shoreline. We plan to rest here for a few days, doing some diving and exploring before heading off. We can either go south to the Similan Islands (also beautiful for swimming) or east to the mainland (a part we've never explored). Knowing us, we'll probably try to do both. Why not? We're currently anchored (moored) at 9°23.5'N 97°52.9'E, just off the east side of Ko Surin Tai (see a Google map of our positions here). Our trip covered 337nm from Little Andaman in exactly 3 days.